In the March 2011 edition of the Atlantic, the writer B.R. Myers  North Korea expert, hater of books a lot of people like, vegan  launched a broadside against foodie-ism and food writing. Myers took aim at chef-authors like Anthony Bourdain, who celebrates an unabashedly hedonistic approach to eating, and Gabrielle Hamilton, the author of the appropriately titled memoir Blood, Bones and Butter. To Myers, what's missing in the new foodie literature  and in the growing pop-cultural obsession with food, seen in the success of reality shows like Top Chef  is any sense of morality. Gluttony used to be one of the seven deadly sins, but now guilt has been expunged from good eating as long as food is prepared sustainably. Those in the food movement justly scorn the factory farms that make fast-food hamburgers, Myers notes, so "the contemporary gourmet reacts by voicing an ever-stronger preference for free-range meats from small local farms. He even claims to believe that well-treated animals taste better, though his heart isn't really in it." Myers is being a bit unfair, painting the entire food movement with a broad, bloody brush. Bourdain's highly successful shtick may involve traveling to foreign countries and scarfing down massive quantities of exotically prepared meat, but Myers ignores the growing body of food writers like Mark Bittman and Tom Philpott who spend more time analyzing the failures of U.S. agricultural subsidies than they do describing the perfect fried chicken. Still, Myers scores a hit: Just how sustainable can the food movement be if it still celebrates meat eating, however humanely and carefully farm animals are treated? If anyone can answer that question, it's Gene Baur, the head of Farm Sanctuary, the country's leading farm-animal organization, dedicated to lobbying for tougher animal-protection standards and exposing the cruelty in meat production that makes such reforms necessary. Baur started Farm Sanctuary in 1986 and initially funded it by selling veggie hot dogs from the back of a Volkswagen van at Grateful Dead concerts. But from that humble (if slightly clichéd) beginning, Baur has helped get landmark farm-animal-protection laws passed in a number of states, including California and Michigan. The group's shelters in Watkins Glen, N.Y., and Orland, Calif., offer protection for abused sheep, pigs, cows and other farm animals. Baur, a vegan, is the conscience of the food movement. "I think our relationship with farm animals is fundamentally one of exploitation," Baur says. "It's about whether we respect them or not." Baur makes the point that however variable the food movement's attitude toward meat eating, foodies are united in opposition to modern factory farms  also known as Concentrated Animal Feeding Operations (CAFOs). CAFOs, which can hold thousands of pigs, cattle or chicken in tight conditions, have come under attack by environmentalists for the damage they can do to the environment, producing vast amounts of waste in the form of manure. 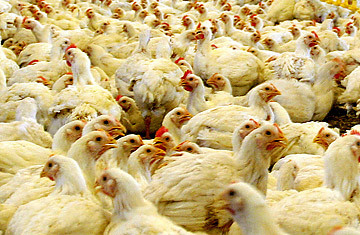 Packing in all those animals in small spaces also keeps costs down, one of the ways the food industry has been able to make meat ever cheaper  with the result that Americans now eat more than 200 lb. (90 kg) of meat a year, not always to the benefit of their health. And life, such as it is, for the animals in a CAFO is nasty, brutish and short. There's a reason the food industry works to keep these operations private  even to the point of trying to make it a crime to photograph a farm without the consent of the owner, as one Florida lawmaker is hoping to do. "There's a common recognition that factory farming is an aberration," says Baur. "Even Bourdain has said that what happens on a factory farm borders on the criminal." How that knowledge should change diet, however, is where the larger food movement parts ways from vegan activists. To many foodies, the solution to the ills of factory farming is better meat production. That means free-range chickens and grass-raised beef, organic pork and sustainable turkey. We're told that this is better for the planet and more humane toward the animals, but the argument that it will also make them taste better when they eventually wind up on our plates is the one that convinces a lot of people. It's a subtle reminder that when it comes to food, our stomachs tend to be more persuadable than our ethics. For Baur, life on a sustainable organic farm is certainly better for a chicken or pig than a capital sentence on a CAFO, but in both cases the creature's fate is the same: an early death at the hand of the slaughterer. That the farmer works with the best methods and sells his meat to knowledgeable consumers at a local market  instead of wholesale to Smithfield or Tyson  makes a difference, but killing is still killing. "At our farm up in Watkins Glen, there was a farmer across the street who used to raise beef cattle," says Baur. "He described how they have a great life and the calves are raised with the mother. And then one day the farmer comes out with a gun to the back of their head and they're gone." Baur has long since realized that most people don't agree with him  at least not enough to go vegan. This is less about social change or a movement than a moral decision each individual has to make. For Baur, who grew up in a conservative Catholic family in California and ate meat as a kid, the biggest insight came when his mother made a chicken dinner while he was in high school and he "saw the body of the chicken on the plate." Later on, he became a committed vegan. "I believe ultimately that we have to ask ourselves what is our relationship to food," he says. And there's the real value of the food movement, whatever your stance on eating meat: it encourages people to think about their relationship to the food on their plate, about the environmental, social, political, moral and, yes, even culinary factors affected by their choices. Myers scolds foodies for being too obsessive about food, but if anything, most Americans have lived in a state of willful ignorance about where their food comes from and what it really costs. When the food movement succeeds, it can break down that ignorance  and then it's up to individuals to decide how that will affect their lives. Some will go vegan. Others might choose to eat meat that has been more humanely produced, following the writer Michael Pollan's basic dictum: "Eat food. Not too much. Mostly plants." And whatever you do, be aware of what you're eating and why. Bryan Walsh's column Going Green usually appears on Tuesdays on TIME.com. See the top 10 food trends.